We’d love your help. Let us know what’s wrong with this preview of God's Amazing World! by Eileen Spinelli. To ask other readers questions about God's Amazing World!, please sign up. Be the first to ask a question about God's Amazing World! I absolutely love this book. I read this to my daughter frequently because she enjoys looking at the beautiful illustrations. I enjoy how it explores everything right in front of their eyes and share the joy of God's creation. A very beautiful story! I sat down with my two grand babies and read them this book. Madison is three and Micah fourteen months. they loved the story. We ended up reading it twice. Later Micah kept pointing at the book so I guessed he wanted to hear it again. This book kept them entertained with the story and all the colorful illustrations. This book will hold there attention. I would recommend this book for every small child I know it say's 4 to 8 but my grandkids set still through it at their young age. The book is a great book that illustrates the seven days God created the earth. Two children playing in their yard observing and making connections with things in their yard to things in the story. Like different shapes in the clouds reminded them of the second day. Come and follow Gracie and Bo through the story. What a wonderful way to teach young children about creation. And God created the Heaven and the Earth! Cousins Gracie and Bo are amazed by the world around them. Gracie tells Bo about the 7 Days of Creation. Together the children discover how great and beautiful the world is. This is an extremely cute book! The illustrations are just beautiful and a perfect fit for the story. I love the two little cats in the background of pretty much all the pictures. They are funny. Gracie and Bo are great characters. I like the happy feeling the story has. I like how Gracie explains the 7 Days of Creation to he Cousins Gracie and Bo are amazed by the world around them. Gracie tells Bo about the 7 Days of Creation. Together the children discover how great and beautiful the world is. A great choice as a teaching tool or just a fun read to share. Beautifully illustrated and not obtrusively religious, even though it shares the 7 days of creation. It is more about the fun the cousins have than "dogma". A little girl teaches her cousin about the seven days of creation as they play outside. A very well done re-telling of Genesis 1-2 that is very kid-friendly in manner it is communicated and illustration style. Great resource for Bible story time at home or at church. 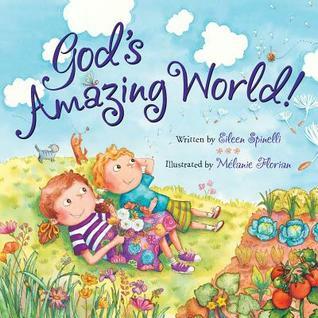 In this very cute book, a little girl and her cousin use everyday child's play to learn about creation. The pages are colorful and the artwork does a great job of keeping little one's attention. The colors in this book really caught my attention and it teaches children about what God made on the first seven days in the bible. This book charmed the socks off me. I loved how playfully functional it was. It taught a wonderful creation lesson while at the same time, it presented many kid-friendly activities and game ideas. Trivia About God's Amazing World!